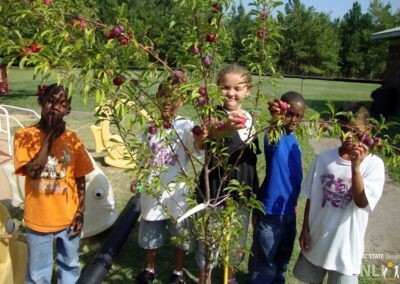 Preventing Obesity by Design (POD) is aimed at reversing the trend toward childhood obesity by improving OUTDOOR ENVIRONMENTAL DIVERSITY of childcare centers, which research suggests can increase children’s level of physical activity, increase time spent outdoors by children and teachers, and increase children’s awareness of vegetables, fruit, and nuts as healthy foods. 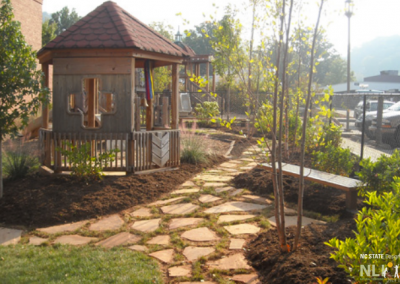 POD considers design of outdoor environments in early childhood as a preventive health intervention. 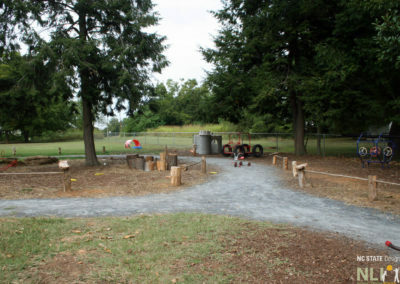 The project is driven by a) evidence that young children learn most effectively (good nutritional habits for example) through hands-on experience, and b) evidence that being outdoors is critical to children’s physical development (outdoor environments are correlates of physical activity; green environments in particular support attention functioning). In addition, understanding food selection and preparation may support the development of lesson plans related to language, math, science, the arts, and other subjects. 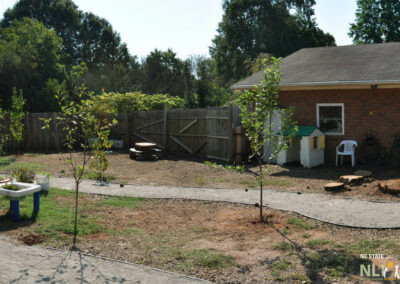 Thirty-one centers are participating in the current program, including three pilot project sites where the community design strategy was tested and refined. 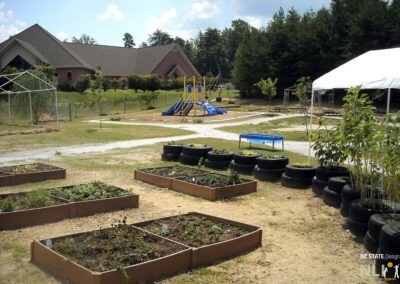 The LONG TERM GOAL is to generate and transfer knowledge to create a cultural re-alignment of care for young children emphasizing the importance of the outdoors as a preventive health strategy. Kids running on a recently constructed path. 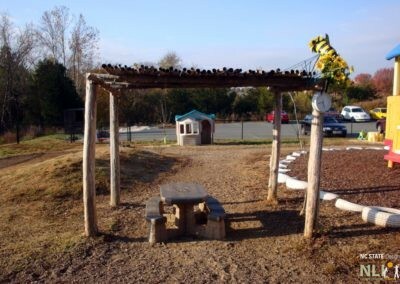 We show teachers how to use the outdoors to promote physical activity and healthy nutrition. 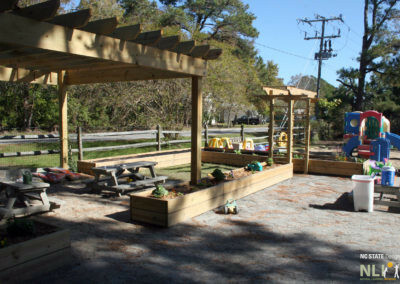 We encourage projects to include preschool staff/volunteers and help them modify their outdoor play and learning environments to support children’s daily nutritional and physical activity needs. Ask about how we can help you to buy plant materials and tools and provide honoraria to support lead teachers to implement projects. We ensure transfer of knowledge. 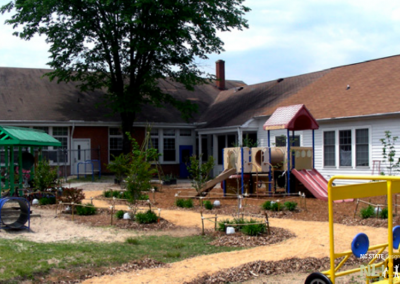 The 31 demonstration projects act as catalysts for change by other NC childcare providers. Site Discovery The POD team visits each center to review the base map of the site. 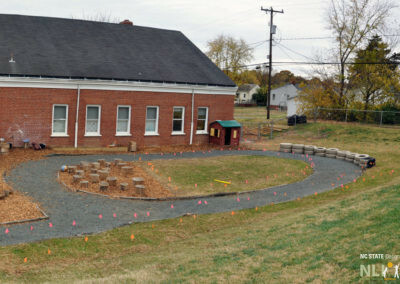 Adjustments are made to the base map if needed and a walk through is conducted to become familiar with the outdoor space. 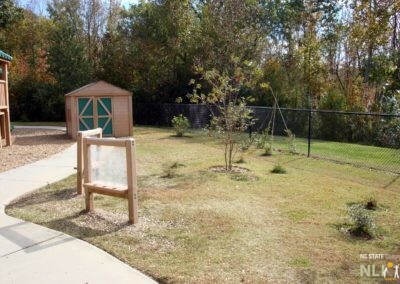 Preschool Outdoor Evaluation Measurement Scale (POEMS) POEMS is an assessment tool for evaluating the quality of outdoor environments in childcare centers for children 3-5 years old. A member of the POD team and a staff member from each center conducts the POEMS evaluation. Input from Teachers, Parents and Children Teachers and parents are asked to fill out a short survey stating what they like and dislike about the outdoor space and what changes they would like to see happen. 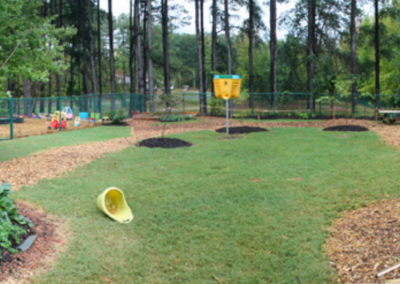 Children’s input is essential and key to the improvement of their outdoor space. 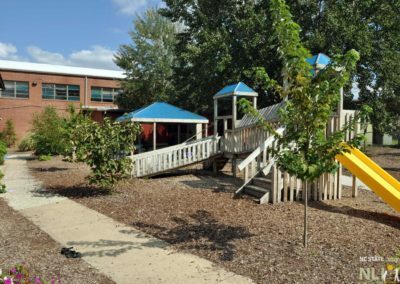 Teachers are asked to guide children into a brainstorming session where they can draw and write what they want their outdoor space to be. Training Workshop Centers attend a full day workshop on the impact of the built environment and child development. 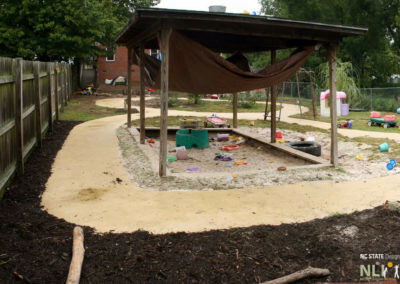 The session includes an introduction to the Preschool Outdoor Environment Measurement Scale (POEMS), a review of each site, and a presentation on the step-by-step participatory design process. Design Workshop All centers attend a full day design workshop and program development. 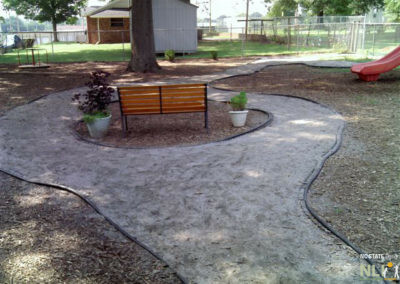 Using the input from teachers, parents and children, each center designs their ideal outdoor space with the guidance of the design team. Design Charrette The design team meets for an in-house design charrette to discuss the designs from each of the centers. 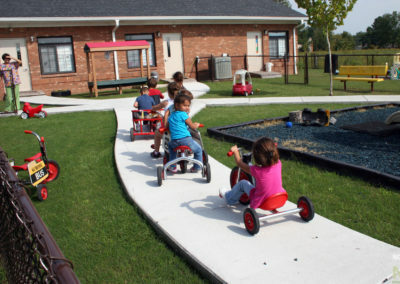 Childcare and safety regulations are considered in the process. Conceptual Design Each center individually meets with the design team to review and comment on the conceptual design and finalize their design. 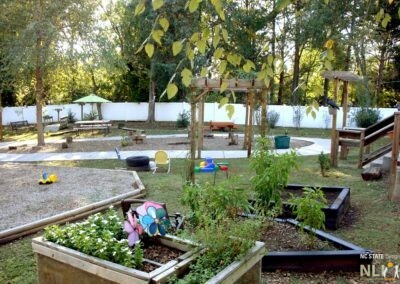 Centers are guided to organize their community to support the environmental changes of the play area. Teacher Training NLI trains teachers to use their new outdoor learning environment. Settings and their purposes were discussed. 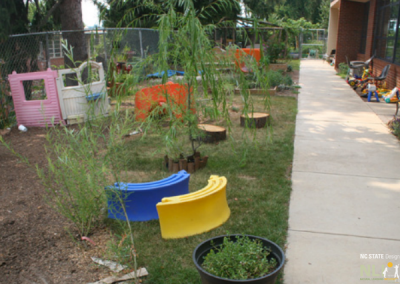 Support for implementing new ideas for informal learning in the outdoor curriculum. Installation Each center with the help of the NLI staff, prepares their outdoor environment for the installation of plants and trees. Volunteers are a crucial part of the planting process. Evaluation The NLI team visits each center and evaluates the progress made by each center. 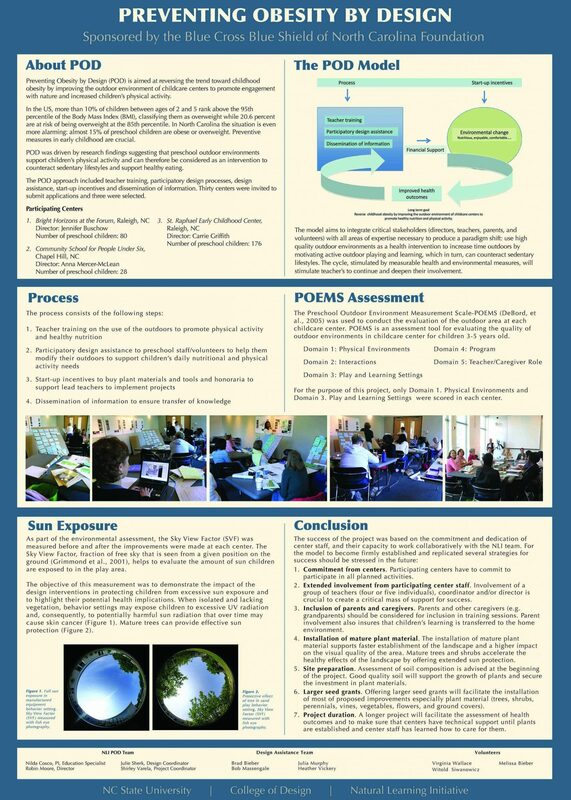 POEMS evaluation will also take place at the end of the project. 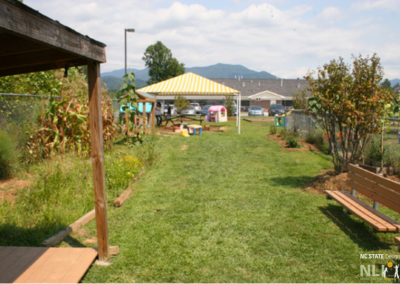 Show & Tell The three centers act as catalysts for change by other NC childcare providers. They present their experience at a public event organized by NLI. 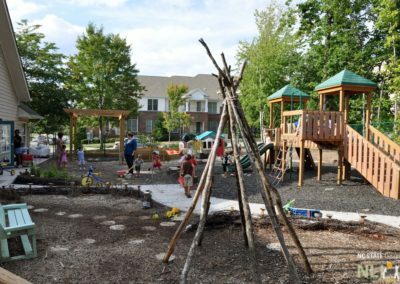 Evaluations from the 27 participating POD centers provided insights into the benefits of enhancing child care centers with outdoor learning environments through the participatory design process. As these testimonials show, children, families, and entire communities have a lot to gain from a better connection with the natural world. 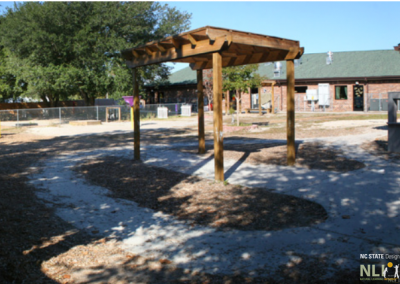 "For a community with little to be proud of, this playground is a proud achievement, a blessing, and a gift for everyone. " "People in town walk around the fences to see what's going on. We were the talk of the town!" "Our proudest moment has to be watching the children with the natural elements - flowers, butterflies, branches, overcoming fear of bees, worms and crickets. They have learned how to be gentle with butterflies and insects." 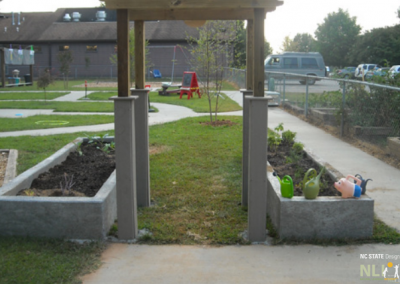 "The kids run out everyday to check to see what’s growing. "Our proudest achievement would have to be the discipline improvement. The kids are not all doing the same things as each other, instead they are using their imaginations more." "They are learning control and ethics in how they interact with nature: what to pick, what not to pick." "Our biggest success was the design - having a direction to go and a vision to implement." "The way you listened to us and put the plan together was exceptional. The plan was exactly what the teachers had envisioned." 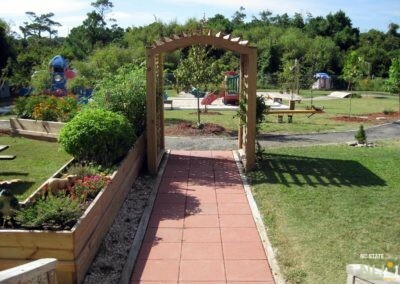 The garden is a kind of therapy to the children from difficult situations and with special needs. "There are more ways for disabled children to play and interact with other children, not just watching." 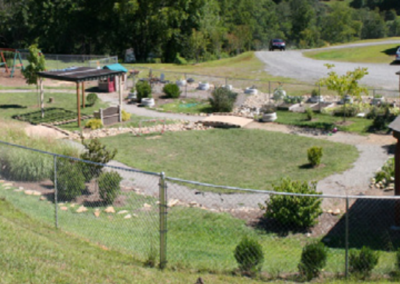 "For most of the kids, their time here is the only opportunity they have to play outside." 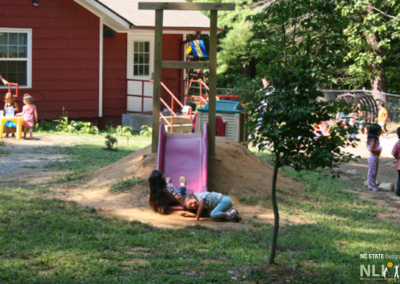 “The whole playground is so much more engaging; the kids are neither overwhelmed nor bored. They didn't run before because it was too overwhelming; now they run." 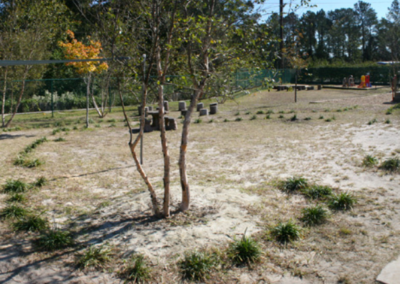 "The children love the trike path and log seating, and building clubhouses with the logs and tree cookies: building, stacking, carrying." 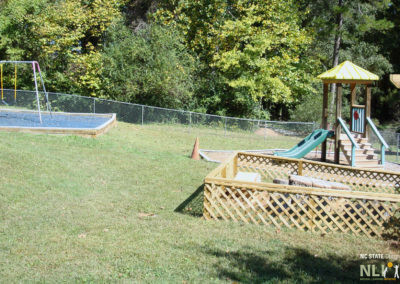 "The playground has totally changed. 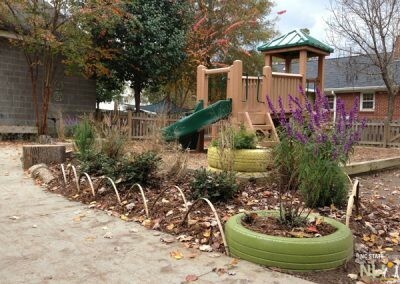 The children have adapted, they smell the flowers and dig in the dirt; not just playing on the equipment." "The kids sleep way more." We are proud of the whole thing - seeing all the components come together. 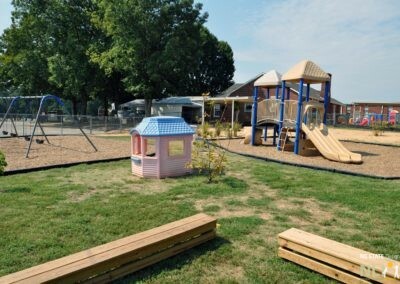 We take parents out on the playground at orientation and are proud of the space. "I hope that the children getting this experience here will be pulling their parents outside." At the planting day every family was represented, and donors stopped by to help – over 70 volunteers.